Studies of Hong Kong media primarily examine whether China will crush Hong Kong’s media freedom. 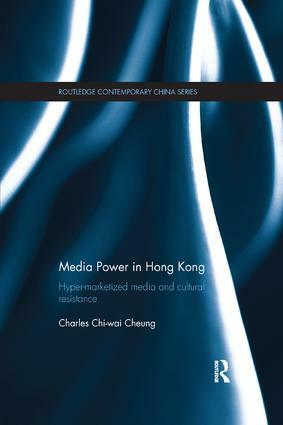 This book however traces the root problem of Hong Kong media back to the colonial era, demonstrating that before the resumption of Chinese sovereignty there already existed a uniquely Hong Kong brand of hyper-marketized and oligopolistic media system. The system, encouraged by the British colonial government, was subsequently aggravated by the Chinese government. This peculiar system is highly susceptible to state intervention and structurally disadvantaged dissent and marginal groups before and after 1997. The book stresses that this hyper-marketized media system has been constantly challenged. Through a historical study of media stigmatization of youth, this book proposes that over the years various counter forces have penetrated the structurally lopsided Hong Kong media: independent, public, popular and news media all make occasional subversive alliances to disrupt the mainstream, and news media, with a strong liberal professionalism, provide the most subversive space for challenging cultural hegemony. The book offers an alternative and fascinating account of the dynamics between hegemonic closure and day-to-day resistance in Hong Kong media in both the colonial and post-colonial eras, arguing that the Hong Kong case generates important insights for understanding ideological struggles in capitalist media. "Any researcher or student interested in media power should read this book. It provides an original and convincing understanding of such power, based on an extraordinary case study of media stigmatisation of young people in Hong Kong." Professor David Hesmondhalgh, University of Leeds, UK. Charles Chi-wai Cheung is an Assistant Professor at the Hong Kong Baptist University, Hong Kong.